Put the dip in the refrigerator for a few hours, so that all the flavors melt into the sour cream. It’s just that simple! This dip is really good with potato chips! Some people substitute low-fat or fat-free sour cream for the real thing. If I’m going to make a substitution, I prefer to use yogurt. Yogurt is a much healthier alternative to sour cream. Fat-free Greek yogurt (Fage) is the best kept secret at the grocery store. (Less than ½ the calories of sour cream and no fat!) It is very thick and rich and is a perfect substitution for the sour cream in the Onion Soup Dip. Many dips combine both sour cream and mayonnaise for the base of the dip. (Now we are talking serious calories!) This adds both flavor and an even creamier texture to the dip. Drain it in a colander and, with your fingers, press out as much liquid as possible. Then squeeze out all the extra moisture by putting the spinach in a paper towel and squeezing. If you didn’t squeeze out all the excess moisture from the spinach, your dip would be very watery. Now just mix everything together. Then put the spinach dip in a nice serving bowl. Cover it with plastic wrap and let it chill in the refrigerator for a few hours before serving. You can serve your spinach dip with fresh vegetables, chunks of pita or rye bread, or crackers. Be sure to check out my video on how to make a fresh vegetable and dip platter. For those of you who would prefer a hot spinach dip, I have a recipe for The Best Hot Spinach Dip Ever! there is just no better dip than this famous lipton’s or knorr’s onion soup mix wth sour cream. Many a vernissage, or cocktail praty has been graced by this dead-easy winner of a dip! Here’s my thought: looking at your two dips, I thought to myself — why not make a combo ? 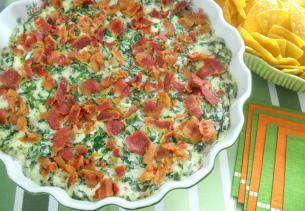 I would do the onion dip and then throw in some of that spinach! take a round loaf of bread and basically cut a big hole in it, and carve out bread chunks until the round loaf becomes a “bread bowl”, then pour the dip into this bread bowl and use the bread pieces as part of the dipping, along with all the nicely chopped veggies ! I’m going to combine a couple of different receipes using the Lipton onion soup mix, mayonnaise, sour cream, spinach, garlic, chestnuts, and dill. Wonder will it be too much? The mayo, sour cream, (squeezed dry) spinach, garlic, chestnuts and dill sounds fabulous together. I think the onion soup mix may be just a bit to strong to add as well.